The X-Men have been a popular license with a comic, books, cartoons, video games, and movies. While there have been a few games with certain X-Men in them, we haven’t gotten a true board game that features the teamwork and squad combat involved with these mutant. That’s changing though, with the release of X-Men: Mutant Revolution. WizKids and Gale Force Nine are pleased to announce the release of the new HeroClix strategy game X-Men: Mutant Revolution, in North American retail today. X-Men: Mutant Revolution allows you to play as classic X-Men characters — including Wolverine, Cyclops, Magneto, and Storm — as they lead their school against its rivals. In the game, 3-4 players will recruit heroes and students, training each team and sending them on missions to spread your vision for mutants to the world. In the aftermath of the Phoenix event, new mutants are appearing all over the Earth. Wolverine, Cyclops, Magneto, and Storm each have a vision for the future, but will they unite humans with mutants, or will they tear the world apart? Play as Wolverine, Cyclops, Magneto, or Storm as they lead their school with unique powers and abilities. Recruit heroes and students. Train your team and send them on missions to spread your vision for mutants to the world. X-Men: Mutant Revolution HeroClix Strategy Game is a head-to-head battle for the future of mutant-kind, where 3-4 people play as leaders of the mutant schools. Based on the best-selling game Spartacus: A Game of Blood and Treachery from Gale Force Nine. 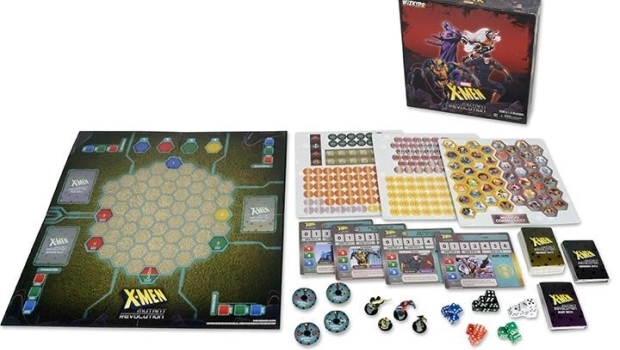 The X-Men: Mutant Revolution Strategy Game includes four (4) character miniatures and Bidding Dials featuring an all new application of WizKids’ patented Combat Dial system. I know that a lot of people enjoyed the game Sparacus: A Game of Blood and Treachery. We’ll have to find out what differences come out with the X-Men during this Mutant Revolution.